Travel, like dreams, is a door that opens from the real world into a world that is yet to be discovered. One of the delights of travel for me is to visit remote places. Sometimes getting to a place is as interesting as the destination itself. I knew Mrauk U would be interesting (ancient capital of the Arakanese kingdom, now know as the Rakhine state) but I wasn’t expecting Sittwee (also spelled Sittwe) to engage me as much as it did. To get to Mrauk U, you have to take a boat from Sittwee, which is close to the border of Bangladesh. To get to Sittwee involves a long (possibly twenty four hour) journey over typical Myanmar roads (full of potholes) or a short (but expensive) flight from Yangon. I opted for the flight not so much to avoid a road trip but because reports of whether you could actually do it were so variable. 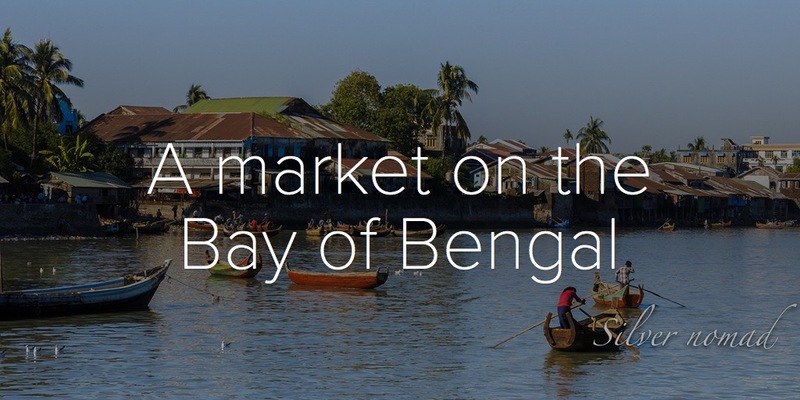 Sittwee is situated on an estuarial island at the confluence of three rivers (Kaladan, Mayu and Lay Mro) that empty into the Bay of Bengal. When Mrauk U was the capital of the Arakanese kingdom (1430 to 1785), with a population estimated to be 160,000, Sittwee was a small fishing village. The British captured the Arakan area, now known as the Rakhine, during the First Anglo-Burmese war (1825). They promptly moved the capital to Sittwee, which was much nearer to the coast and therefore more accessible. Because of its location, on the trading route from India to the Far East, it grew into an important port. But time changes everything. By the time I reached Sittwee, it had the air of the back of beyond, where you might meet an old Colonial Southeast Asia hand around any dusty corner. And Sittwee had seen plenty of foreign nationals come and go over the years. The Dutch erected the unusual clock tower in the eighteenth century, a reminder that the Dutch East India Company was actively trading in the area. Nowadays, the town seems unprepossessing, sleepy almost – until you reach the market. Close to the clock tower, which stands on the broad and dusty main street, you turn right and follow a much narrower street. It rapidly becomes busy – people working on the street or in buildings that open onto the street. When the street becomes clogged with people and traffic – a special form of vehicular conveyance known all over Asia as a rickshaw – you know your destination is nearby. The usual guidebook advice to tourists is to go to a market early in the morning. This is usually good advice – you are guaranteed all kinds of action. I arrived at Sittwee market in the mid-afternoon. Most of the vendors (women mainly) were relaxing and chatting to neighbours while last minute shoppers straggled by. The ladies chopping and selling chickens were more than happy to let me take photos. As the ‘real’ work of the day had ended, they also enjoyed looking at what I showed them on the LCD screen at the back of the camera. No one spoke English but their delight in seeing themselves on the screen was palpable. It wasn’t long before they were directing me to take photos of their friends in the produce area and of the ladies on the sewing machines. Wandering in this market requires care: it is large and very messy underfoot. I was glad I was wearing solid sandals with soles that gripped strongly. It was quite wet – much water is sloshed over the floor to remove the fish and chicken entrails as well as the detritus from the fruit and vegetables. It was a labyrinthine market and I kept walking onwards away from the street. When I emerged at the other end, I was on a pier that overlooked the Bay of Bengal. It was a most glorious sight, a wood block print from an old history book but in colour. The late afternoon sun, golden and brilliant, burnished an assortment of boats that could easily be harbouring pirates ready to storm ashore with knives grasped between teeth and cutlasses swinging at their sides. The light reflected from the shimmering blue sea was blinding but gradually the scene before me settled into one of late afternoon commerce – men in small rowing boats waiting to take ‘shoppers’ with all of their goods out to the larger boats anchored in the bay. Viewed from the vantage point of the pier, Sittwee looked like a classic tropical outpost – all palm trees and tin roofs – just waiting for Somerset Maugham or Joseph Conrad to drop by and sip a Scotch or gin as the brilliant sun slipped into the sea. I spent a long time on that pier, watching the people come and go, but eventually I wandered back into the market, said goodbye to the chicken ladies, and found my way back onto the street. The street in front of the market seemed just as busy as when I’d entered but I managed to maneuver myself around the rickshaws and avoid the little pick up trucks waiting to carry people home. I walked along the street that ran parallel to the Bay of Bengal, which I could see shining in the gaps between buildings. I also found the dark side where people cast their garbage into the sea and the sea gives it right back. I found an area full of large sacks, which I realized contained rice. The area around Sittwee is the second largest area growing rice outside of the Ayeyarwaddy delta. Sittwee is such an important hub for the rice growing and exporting business that the government has been talking about building a deep-sea port. It would probably make life easier for the people – no more hauling rice sacks on their backs – but the rice market would lose much of its charm. Someone like me, with a camera and a penchant for out of the way places that time seems to have slipped past, does not always welcome what is deemed to be progress for the people who live and work there. Sittwee is very photogenic and on my way back to my hotel, I came across a troop of Thai photographers from Bangkok, draped with a wide assortment of serious Canon and Nikon gear. They, like me, were en route for Mrauk U. Sittwee was so entrancing that I’d forgotten it was merely a staging point on my way to the ancient capital of Mrauk U. As the sky darkened, I joined a Swiss woman I met on the plane at a local viewpoint for a beer and a chat. We watched a spectacular sunset over the Kaladan River where it empties into the Bay of Bengal. The next morning, the two of us, along with a German guy who had also been on the plane, rode in the back of a truck and were deposited at the boat dock fifteen minutes before seven a.m., the time at which we had been assured the boat would leave. We waited and waited, along with everyone else, because the boat wasn’t leaving until nine. But even that was interesting. For a place that started out looking like the back of beyond, Sittwee turned out to be quite a little jewel. Architecture is a visual art and the buildings speak for themselves. Buddhists like to build their scared places at the top of a hill. I’m not sure why. Maybe, it is because each step upwards expiates our earthly sins and carries us closer to a purer state in which we can enter the sacred spot. Kiplings’ ‘beautiful winking wonder’, the Shwedagon Pagoda, sits at the top of Singutarra Hill, which is 167 feet above Yangon. There are four covered walkways with steps that climb the hill; at the top sits a splendid stupa covered with gold plates. On my first visit in 1999, I carried my karma step by step, up the 167 feet to reach the terrace via the least used walkway at the eastern entrance. I had stayed near Kandawgyi Lake and this was the closest entrance. On this visit, I went looking for the western entryway because it has escalators. (The other walkways now also have lifts but I am claustrophobic and prefer escalators.) All taxi drivers in Yangon know where the Shwedagon is located but not all know where the escalators are. My taxi driver took me to the southern entrance (on Shwedagon Road). Before I dismissed him, I hopped out and asked one of the parking lot attendants to see if we were at the correct entrance. We weren’t. He directed the taxi driver to the western entrance, which seemed a long way round and definitely too far to walk in the late afternoon heat. Shoes must be removed at the bottom. You can leave them with a minder but I took mine with me in my backpack because I was not sure by which walkway I would descend. Unlike my first visit, where I plodded up the Singuttara Hill, I floated to the top on the escalators and stepped out onto the marble terrace still warm from the rays of the late afternoon sun. I was immediately in a magical and exotic location. Gold everywhere. Pagodas and Buddhas in vast quantities. And people galore. The Shwedagon is a shrine that lures Buddhists from all over Myanmar and all corners of Asia. It vibrates with a quiet peace. The Shwedagon is the most sacred pagoda in Myanmar. The stupa rises 325 feet above the terrace and is covered with golden plates, not merely gilded with gold leaf. The spire or hti that seems to pierce the brilliant blue sky is covered with a multitude of precious gems. It’s an enthralling place in which to spend several hours, marveling at the architecture and at the devotion of the people. The setting sun burnishes the pagodas and shrines surrounding the central stupa. There are so many Buddhas and all quite beautiful in their own way. I often wonder how the people decide to which Buddha they will pay their respects, for choose you must as there are Buddha statues to last you a lifetime. As the sun sank, the orange of the sky was matched by the glow of the lamps being lit on the small wall that surrounded the central stupa. Clearly, a temple festival was taking place. The mood was calm and joyful. Shwedagon Pagoda is an exotic and beautiful place with almost a cacophony of architectural styles. Yet the shrines and pagoda continue to whisper in my memory long after the escalator deposited me at the bottom of Singuttara Hill. It gleams softly in my mind’s eye whenever I think about Yangon – one of the most entrancing Buddhists sights in all of Asia.